This film is just one of his silly, but mythical and awe-inspiring films that he's done for years. I immediately considered it as my new favorite animated movie and while the film has been challenged by a few other great films since, it still holds that place today. 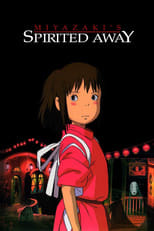 Just like a well made live action film, Spirited Away has amazing cinematography, lighting and sets.